This page covers the early (2006-2008) models of the 15" MacBook Pro. Announced in January 2006, alongside the iMac Core Duo, this machine replaced the aging PowerPC G4 based PowerBook range. Models covered on this page are the "pre-unibody" models. All of these have a silver keyboard. The later Unibody models (October 2008 onwards) have a black keyboard and are dealt with on their own page: MacBook Pro 15" Unibody. We also have pages on the MacBook Pro 13", MacBook Pro 17" 2006-08 and MacBook Pro 17" Unibody. As well as the change of processor between the MacBook Pro and PowerBook G4, this machine moved to a SATA rather than IDE drive (the first Apple laptop to do so), and replaced the PowerBooks PCMCIA expansion slot with the new ExpressCard/34. Airport Extreme and Bluetooth are built in and a SuperDrive is standard on all models. 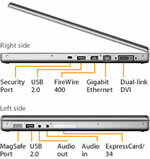 However the FireWire 800 port was dropped on the very first revision 15" version, leaving just FireWire 400 and USB 2.0. Later revisions replaced the FireWire 800 port. Apple specifications for the original 15" MacBook Pro can be found here and the glossy screen version introduced in May 2006 here. In October 2006 the line was updated to use the Intel Core 2 Duo CPU and take up to 3GB of RAM (as opposed to 2GB on the original model), the missing FireWire 800 port was also added to the 15.4" version. Apple specs here. In June 2007, a further revision bumped the speed up to 2.4GHz, updated the Airport card to use the 802.11n draft specification, and allowed up to 6GB of RAM to be installed. Apple specs here. A minor refresh was made in November 2007 - specs here. In February 2008 the MacBook Pro moved to the Penryn processor running at 2.4, 2.5 or 2.6GHz and introduced a multi-touch track pad. Compatibility for upgrades was unchanged. Apple specs here. In October 2008 the new MacBook Pro 15" Unibody replaced this machine. The MacBook Pro looks similar to the 15" PowerBook G4 Aluminium - it is the same colour, although slightly thinner and with a slightly larger screen. The best way to distinguish this machine from the earlier PowerBook G4 is to check System Profiler for the CPU type (Intel Core Duo or Core 2 Duo), although it can also be easily identified by Apple's new MagSafe power connector - the power cable is held on magnetically when attached, eliminating the possibility of damaging the machine by tripping on the power lead. This machine can be distinguished from the later MacBook Pro 15" Unibody by the keyboard colour. Machines dealt with on this page have a silver keyboard. Later Unibody models have a black keyboard. There are also 17" versions of the MacBook Pro, which has their own pages. Compatibility between the two ranges of machines is very similar, although not identical, and dates of revisions vary. See the pages for the MacBook Pro 17" 2006-08 and MacBook Pro 17" Unibody. The MacBook Aluminium, released in October 2008 (later replaced by the very similar MacBook Pro 13"), also looks similar. However the MacBook has a smaller 13.3" screen. System Profiler (Apple menu > About This Mac, then click on the "More Info" button) will also tell you what type of Mac you have. The other Intel Core/Core 2 Duo based Apple laptops are the white and black MacBooks, but as well as having a smaller screen, these MacBook come in white or black plastic, rather than the aluminium of the MacBook Pro. There are multiple revisions of the pre-Unibody MacBook Pro 15.4", and while compatibility is similar there is a difference in the amount and type of RAM they can use and a few other differences. To tell the difference between revisions, check the CPU type and speed in System Profile, and compare to the below. 1st Revision: Released Jan 2006 with a 1.83GHz, 2.0GHz or 2.16GHz Intel Core Duo CPU. Has no FireWire 800 port on the 15.4" model. Maximum RAM 2GB (either 2 x 1GB modules or 1 x 2GB). SuperDrive slot in the front. Apple specs here and the glossy screen version here. 2nd Revision: Released Oct 2006 with a 2.16 or 2.33GHz Intel Core 2 Duo CPU. Has FireWire 800 port across the range. Maximum RAM 3GB (1x 1GB + 1 x 2GB modules). SuperDrive slot in the front. Apple specs here. 3rd Revision: Released June 2007 with a 2.2GHz or 2.4GHz Intel Core 2 Duo CPU. Has FireWire 800 across the range. Maximum RAM 4GB (2 x 2GB modules). SuperDrive slot in the front. Apple specs here and for the November 2007 refresh here. 4th Revision: Released February 2008 with a 2.4GHz, 2.5GHz or 2.6GHz Intel Core 2 Duo (Penryn) CPU. Has FireWire 800 across the range. Maximum RAM 4GB (2 x 2GB modules). SuperDrive slot in the front. Apple specs here. If you are still unsure you can contact us on 01223 833 412, or by email for confirmation. If you want to upgrade but aren't happy to install your upgrades then we can help. Simply ask our engineers for further details. Memory listed here is for the MacBook Pro 15" 2006-2008. Follow the relevant link for memory for the: MacBook Pro 13", MacBook Pro 15" Unibody, MacBook Pro 17" 2006-08 or MacBook Pro 17" Unibody. The MacBook Pro 15.4" has two memory sockets. The original Core Duo machines can accept up to 2GB in RAM in two 1GB chips. The first Core 2 Duo machines introduced in October 2006 can support up to 3GB of RAM by using 1 x 2GB module and 1 x 1GB module. The later Core 2 Duo MacBook Pros (June 2007 and Feb 2008) can use 6GB of RAM in 1 x 4GB and 1 x 2GB modules. All these machines use PC2-5300 SODIMMs. See the How To Identify this Mac section above for details on how to tell the difference between these revisions. There is no need to install RAM in pairs in this machine. 1 Not suitable for first revision MacBook Pros, so only for models with a Core 2 Duo processor, not the original Core Duo models. Second revision models can not use 2 of these chips together. 2 Only suitable for models from June 07 onwards - models with a system bus speed of 800MHz can run up to 6GB in 1 x 4GB + 1 x 2GB. Difficulty 3 / 5 - Reasonably easy. Turn off the machine and remove the power cable and battery. The RAM is accessed via a cover on the bottom of the machine secured by three screws. Remove the holding screws and install the new RAM. See chapter 3 of this Apple user guide (pdf) - for the early 2008 version, but procedure is the same on earlier models. All MacBook Pros come with a SuperDrive at as standard. Models dealt with on this page (SuperDrive slot on the front) use an IDE drive, later models (SuperDrive slot on the right-hand side) use SATA. It is also possible to use an external device via FireWire or USB 2.0. Hard drives listed here are for the MacBook Pro 15" 2006-2008. Follow the relevant link for hard drives for the: MacBook Pro 13", MacBook Pro 15" Unibody, MacBook Pro 17" 2006-08 or MacBook Pro 17" Unibody. The MacBook Pro 2006-2008 uses a 2.5" SATA drive. It cannot use drives with a height above 9.5mm. All the following drives are compatible. For the pre October 2008 MacBook Pro, the internal hard drive is difficult to get to, and is not classified by Apple as a user installable part. Installing a replacement drive during warranty will void any remaining warranty. Mac Upgrades does sell drives for user installation, but we cannot offer instructions or support for the install. The graphics card in the MacBook Pro is part of the main logic board, and is therefore not replaceable. 1 For models listed in, and suffering the fault mentioned in this Apple advisory. All MacBook Pro 15" machines covered by this page have an ExpressCard/34 slot for expansion. This is a modern, high bandwidth slot, considerably superior to the old PCMCIA found on the PowerBook range. There is also an internal slot for the Airport Extreme card, which can be replaced or upgraded. 1 Requires Mac OS X 10.5 (Leopard) or later. 2 Requires 10.5 or later. Difficulty 1 / 5 - Very Easy (Express34 slot only). Install any supplied software, turn off the machine and insert the ExpressCard into the socket on the machine. Restart machine and away you go. Listed below are cables, tools and related products we supply for this Mac. The very first model of MacBook Pro 15" (Core Duo processor, not Core 2 Duo) does not have a FireWire 800 port, only FireWire 400 and USB 2.0. All other models dealt with on this page have FireWire 400, 800 and USB 2.0. eSATA can be added as an expansion card. 1 Requires OSX 10.6 or later.